In the Clouds is the third level in World 4 in Yoshi's Island DS and the only level where the player can bounce on clouds. These clouds also make faces if Yoshi stands on them for a set period of time. The stage begins with Yoshi standing on a cloud-like platform, with a Stork Stop nearby. He must navigate his way through other cloud-shaped platforms, some with faces on them. The platforms with a face make Yoshi jump higher. After, the player reaches an area with a moving platform and some Cloud Drops. Yoshi then encounters some more cloud platforms along with some Item Balloons. After a few more platforms, Yoshi goes into another area, where more moving platforms await. 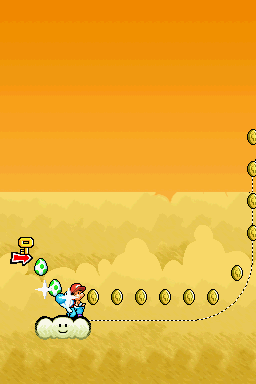 A secret area where Yoshi can become a Helicopter in order to collect coins is also nearby. Then, after some more enemies, Yoshi comes upon another Stork Stop. Soon after, Yoshi finds himself in another area with yet another Stork Stop and a Middle Ring. There, he has to avoid a few enemies, as well as navigate his way through lots of platforms. The player then reaches the second middle ring, along with a new area witch autoscrolls. In this area, there are more cloud platforms, with Nipper Spores also appearing to halt Yoshi's progress. Yoshi then reaches a Stork Stop. After another enemy area, Yoshi reaches the Goal Ring. This page was last edited on April 15, 2019, at 02:13.